Installing a radiant barrier inside most warehouse type buildings will have a HUGE impact on the comfort inside (below) the radiant barrier. Most warehouse buildings have either metal roofs, or built-up roofs topped off with either tar and gravel, or modified bitumen. These roofs typically have very little insulation between the metal deck at the top of the roof to reduce heat transfer. 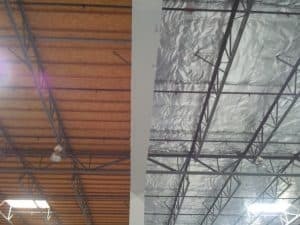 If you can FEEL the heat coming off the roof, you NEED a radiant barrier inside your warehouse! 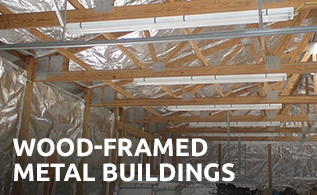 Simply getting a piece of WareHouseFoil™ between you and the HOT ROOF will reflect over 97% of the radiant heat. The warehouse will instantly be cooler and more comfortable. WareHouseFoil™ can easily be installed as a DIY project. Do part or all the building. Installing radiant barrier has a cumulative effect so try it in one area and you will feel the difference. Then keep going on the rest of the building. Ventilation helps. Either a bottom to top ventilation or cross ventilation will work with the radiant barrier for even more comfort. WareHouseFoil™ can easily be installed on top of the purlin cross supports and run between typical purlins. WareHouseFoil™ is available in 48″ wide or 60″ wide widths double-sided. You can install it with either foil facing down or (for a cleaner look but the same effectiveness) try our new foil with a white vinyl side. 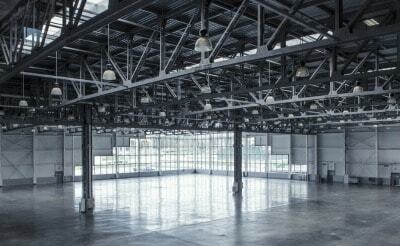 Warehouses are typically built with purlins running across the span of the building. The fastest, simplest install method is to run WareHouseFoil™ on TOP of the cross supports between the purlins. This will give significant coverage and make a huge difference in comfort by reflecting the heat BACK towards the roof. There is no “standard” install method and every warehouse is different. If you need help or advice on how to install WareHouseFoil™ you can call us, or send us pictures or video with your install questions. We will help you figure out a solution for your building! Using some type of lift, the best way is to thread or lift the WarehouseFoil™ over the cross supports between the purlins. 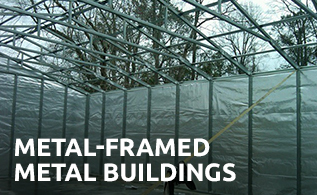 Many purlins are on 60″ centers, so you can start by just pulling the radiant barrier (it will not tear or rip) over the support closest to a wall and lifting as you go between the purlins, over the cross supports. The foil may sag a little bit, but once you get to the end supports covered, wrap the WareHouseFoil™ around the last cross support. Use foil tape or zip ties to secure it tightly on one end. Then, you can pull the foil tight all the way across the warehouse and wrap and tape or zip tie the foil to cross support on the other end. It does not have to be perfect to work. You will instantly feel the difference in radiant heat coming off the roof. Take a look at the picture (left) from above the foil between the roof and the foil. Not every warehouse is built with cross supports; however, fortunately, it’s pretty easy to add cross supports. You may have to get creative. Wire, rope, cable, old wire, rebar, or wood stripping are all good options. Just about anything can be used (you might even have something laying around your warehouse) to create the cross supports. The ideal distance between the cross supports is about 10-15 feet. You can go further, but the foil may hang down a little bit. Remember that adding a radiant barrier has a cumulative effect. This means that the more coverage you have, the better the warehouse feels. Most customers tend to use only one section of their warehouse most of the time, so we suggest you start there!! Do the area you use the most, on a hot-sunny day you will typically be able to close your eyes and feel when you are under the WareHouseFoil™! It’s almost like walking outside on a sunny day and then walking under a shade tree. Once you eliminate most of the radiant heat, you INSTANTLY FEEL COOLER. Then, keep working on the rest of the warehouse.